In the wake of the recent election of Donald Trump as the next president of the United States, like many of you, we have felt shock, grief, and outrage. We have felt fear for the future of our communities, for the safety of our neighbors, and for the impact this next era will have on communities in the Global South who for centuries have struggled for self-determination, justice, and dignity. As we’ve tried to apprehend the terrible consequences of an incoming administration that is so transparently invested in white supremacy, xenophobia, homophobia, and misogyny, we’ve taken to the streets and found courage in our communities. In this time of political uncertainty, we feel called to ground ourselves in the work that has brought us here, and we recommit ourselves to our shared vision of a world free from imperialist violence and rooted in racial, economic, and social justice. 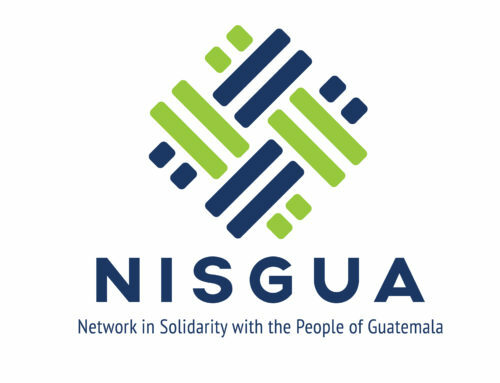 We are painfully aware of the impacts unjust systems have on targeted people and communities in the U.S. and that these systems exert even more pressure on those we hold relationship with in Guatemala. We recommit to internationalism and solidarity during this time of domestic upheaval and believe that solidarity with social movements in Guatemala is an essential component of our social justice strategy here in the U.S.
As we continue to find our way forward, we must follow the leadership, lessons, demands and resilience of those with daily, lived experience in resisting state violence and repression. We cannot make the mistake of choosing one over the other. Now is not the time to narrow our focus; it is urgent that we hold a broader vision that includes grassroots, global solidarity. Today, more than ever, it is critical that people of conscience in the U.S. stand firm with conviction against hate and for the collective liberation of all people. We deeply believe in internationalism and in the instructive resilience and courage of 500 years of resistance to colonialism and imperialism that has guided us for 35 years and will continue to guide us in the years to come. For the PDF version of this statement, click here.